New York is the 3rd most populous state in the United States with a population of over 19 million people. Nicknamed The Empire State, New York is a vibrant state full of diverse cultures and famous cities like New York City. 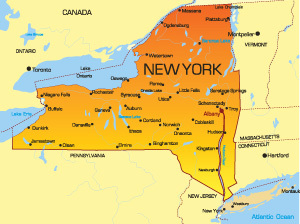 Although New York City is the largest city with a population of 8 million, the capital city is Albany. The bordering states include Pennsylvania, New Jersey, Delaware, Vermont, Connecticut, Massachusetts, and Rhode Island. The major modes of transportation are roads, subways and air. Major highways are I-81, I-87, and I-95. Large airports like La Guardia and John F. Kennedy International Airport. Notable universities in the state are Columbia University and Cornell University. Major attractions include the Statue of Liberty, Freedom Tower and Yankee Stadium.